We are re-booting the ArcVenture series for the 21st century! New locations, virtual reality, online interactions and much more! The first ArcVenture computer programme was published in 1991 by Sherston Software. The programme was about the Romans in Britain and focused on an archaeological dig site in Woodchester, Gloucestershire. Rather than dealing with information about rulers and battles, ArcVenture sought to introduce the ordinary people and culture of the time using archaeological artefacts to prompt discussion which lead to an adventure back in the time of the Romans in Britain. 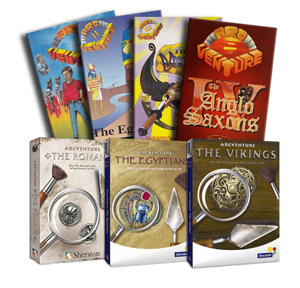 The first programme was an instant success and so the author, Mark Vanstone went on to create three more ArcVentures: The Egyptians, The Vikings and The Anglo Saxons. The third (The Vikings) won the gold award for Best Educational Programme of the Year at the BETT show in 1994. In 2003 the series was re-worked to run on PC and Mac computers and continued being sold by Sherston Software until 2015. At the end of 2017, the original author of the programme, Mark Vanstone started work on a new chapter of the ArcVenture story which will take the series into the online age and connect the history with up to date knowledge. ArcVenture Supporters get updates to the project via a newsletter. They also will have access to the beta test program. ArcVenture Investors get updates to the project via a newsletter and will get early access to completed resources before they are made public. They also will have access to the beta test program. When I reach $500 per month I'll start a video cast series for patrons showing progress of the project and introducing people involved.